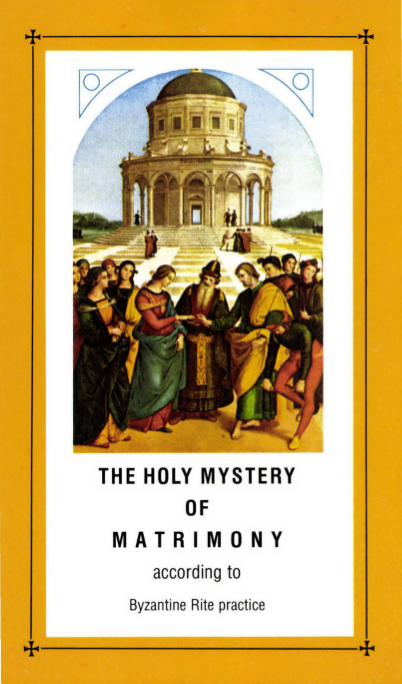 The Holy Mystery (Sacrament) of Matrimony is one of the seven channels of divine grace, instituted by Christ, to sanctify and to support Christian family life. A Christian marriage is a vocation, that is a special invitation of God to two baptized persons to marital union, in order to devote themselves to the service of a new life in Christ. That is why St. Paul considers Christian marriage as a “special gift of God.” (1 Cor. 7:7) The Council Fathers of Vatican II did not hesitate to underscore the great importance of married life, sanctified by a “special Sacrament.” (ct. Constitution on the Church, n. 35). 1. The very first pages of Holy Scriptures give witness to the great dignity of matrimony, indicating special reasons for its institution by Almighty God. Created to the “image and likeness” of God (Gen. 1 :26), man was endowed by God with a spiritual soul. While the body is passed on from the parents to their children through the process of generation, the human soul, the “breath of life” (Gen. 2:7), must be instilled as if by breathing directly by God. In other words, God must necessarily enter into marital union, so that the procreation of children and the propagation of the human race may be assured. Having made man ” male and female,” God blessed them and said: “Be fertile and multiply, and fill the earth” (Gen. 1 :27-28), in cooperation with God’s design of procreation. Thus the spiritual nature of man and his vocation to cooperate with God in the propagation of the human race constitute the great dignity of matrimony, especially when it is sanctified by the Church, as ordered by Jesus. At this point of the primordial story, the sacred author adds an important reflection, which later Jesus made His own: “That is why a man leaves his father and mother, and clings to his wife; and the two of them become one body.” (Gen. 2:24 = Mt. 19 :5) By these words the sacred writer intended to point out that the marital union is honorable, since it was willed by God. 2. In the Old Testament, marriage had no specifically religious character and was considered rather as a private matter. Over the course of centuries however, under the influence of pagan customs and the tolerance of the Mosaic Law, the pristine institution of marriage became to a certain degree perverted. Hence our Lord, who came “to restore the law” (Mt. 5:17), among other things, had to restore also marriage to its pristine honor and dignity, as it was originally intended by God, proclaiming divorce unlawful. In other words, in order to restore the marriage to its pristine dignity as willed by God, the Mosaic permission of divorce had to be revoked and the indissolubility of marriage had to be renewed. Jesus, by the divine authority invested in Him, did just that by the following statements : “I say to you, whoever divorces his wife and marries another commits adultery” (Mt. 19 :9) ; and ” If a woman divorces her husband and marries another, she commits adultery” (Mr. 19:12). The Church Fathers, from early times, insisted that Christian marriage be celebrated in the church, being solemnized with the religious rites. Already St. Ignatius of Antioch (+ 110) ordained: “It is proper for those who marry to be united with the consent of the bishop (presbyter), so that the marriage may be according to the Lord and not according to lust.” (cf. his Epistle to Polycarp, 5) And St. John Chrysostom: ” Do you want Christ to come and sanctify your marriage? Then invite the priest. 5. Over the centuries, the ritual of marriage was subject to various changes and additions . It received its present form only in the middle of the seventeenth century, when two originally separated rites, that of Betrothal and of Crowning, were combined into one Ritual of Marriage (ct. P. Mohyla, Trebnyk/Ritual / , Kiev 1646). Originally, a Christian wedding was preceded by a Rite of Betrothal, which consisted of a ring ceremony and a priestly blessing. The use of rings at the betrothal is already mentioned by Clement of Alexandria (+ about 215). To avoid all canonical implications that later were imposed on church betrothal by the Council of Trullo (691), the majority of engagements were celebrated privately, without the presence of a priest. For this reason, the Rite of Betrothal, often referred to by the Fathers as the Ring Ceremony, was then celebrated immediately before the marriage, but still as a separate service. It was Metropolitan Peter Mohyla of Kiev who finally inserted the Ring Ceremony into the Marriage Ritual in his r itual book, called Trebnyk, printed in 1646. The Byzantine Church, nevertheless, preserved also the old Rite of Betrothal as a venerable “ancient tradition,” but all its canonical implications were revoked (cf. Eastern Canon Law, can. 782). The wedding rings symbolize the pledge of fidelity between the spouses. The exchange of vows is followed by a moving ceremony of crowning, mentioned already by St. John Chrysostom ( + 407), by which the marriage becomes officially recognized by the Church . The crowning of spouses was adapted from the Old Testament (Is. 61 :10). It symbolizes the “glory and honor” of Christian marriage, since it was insti tuted by God and elevated by Christ to the dignity of the holy mystery (sacrament). Behold the beauty and deep spiritual meaning of Christian marriage, sanctified and blessed by our Lord, Jesus Christ, who through His holy mysteries (sacraments) continues to live and act in union with His mystical Spouse, the Catholic Church. 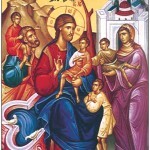 o Holy God, You formed man out of the dust of the earth, You fashioned a woman from his rib and joined her to him as a helpmate, for it pleased your great generosity that man should not be alone upon the earth. Now, 0 Master, stretch forth your hand from your holy dwelling place and join these your servants N. and N., for You alone join the wife to her husband. Unite them in one mind and in one flesh, granting them fruitfulness and rewarding them with good children. For yours is the kingdom, and the power, and the glory, Father, Son, and Holy Spirit, now and ever, and forever. Amen. Groom: I, N., take you, N., to be my wife, and I promise to love you, to respect you, to be always faithful to you, and never to forsake you until death do us part. So help me God, one in the Holy Trinity, and all the Saints. Bride: I, N., take you, N., to be my husband, and I promise to love you, to respect you, to give you matrimonial obedience, to be always faithful to you, and never to forsake you until death do us part. So help me God, one in the Holy Trinity, and all the Saints.